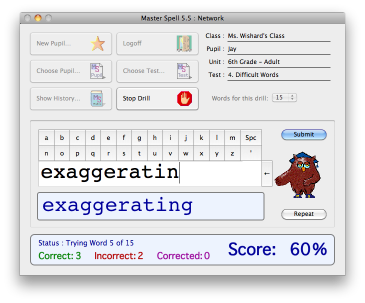 Master Spell administers spelling drills using over 3,600 included words and sentences spoken with a real voice and supplemental guidance using the Mac's Text-to-Speech. Parents and teachers can record their own words and sentences. New version 5.5 keeps track of mastered words and makes mastery 100% correct spelling of all words in a drill as the standard. Pupils can now type along with the correction. And there's a new set of alphabetic buttons for younger students to more quickly find the letters. Includes definitions or example sentences with words for 1st Grade all the way to those commonly misspelled and difficult words for adults. The 1st through 5th Grade is divided into Dolch lists with core words for each grade level. Reinforcement is done by short-term memory by previewing words before drilling and retrying for half-credit. Achieving mastery gives the student a goal with a progress bar and a certificate printout once accomplished. Corrections are spelled visibly and audibly. A running list of trouble words can be reviewed, integrated with drills, saved as tests, and printed. Use the menubar above to see screenshots, download, purchase or read the help.